» The Office of the Special Rapporteur for Freedom of Expression of the Inter-American Commission on Human Rights announces that the Office has a new website (www.cidh.org/relatoria). In a stirring farewell, the Organization of American States Permanent Council praised Secretary General César Gaviria, as he concluded his second and last five-year term at the helm of the hemispheric organization. The member state representatives hailed Gaviria for boosting the Organization’s reputation for promoting democracy, defending human rights and promoting conciliation in the hemisphere. 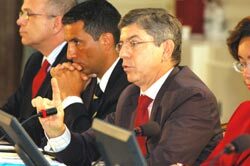 The Inter- American Convention against Corruption, approved in Caracas, Venezuela, in 1996, was a milestone in this field. At the time of its adoption, many still questioned whether international cooperation against corruption should be the subject of an international treaty. Adoption of the Inter- American Convention against Corruption demolished the arguments of those who refused to accept binding commitments, with international legal and political consequences in this area. El Sistema es hoy más transparente. Hemos ido avanzando en darle a la Corte y a la Comisión la mayor autonomía institucional posible. El Sistema de los Derechos Humanos ha cumplido para la OEA un papel didáctico e ilustrativo entorno a la participación exitosa y efectiva de la sociedad civil en las tareas de la Organización. El Sistema Interamericano está más activo que nunca. Sin duda, contamos con un mayor consenso entre los Estados miembros, con mejores reglamentos y mayor admisibilidad, con mayor participación de la sociedad civil, con un uso más amplio y efectivo de las funciones del relator, en particular con respecto a la libertad de expresión. Se trataba de avanzar en la cimentación de una democracia integral, en donde exista un Estado orientado a servir a la ciudadanía, abierto a escucharla y con instrumentos adecuados para realizar efectivamente las funciones que le correspondan y rendir cuentas de su gestión; un órgano legislativo deliberativo; una justicia constitucional garante del consenso democrático; un ejecutivo gobernante, fundado en la legitimidad derivada de los procesos electorales limpios y transparentes y en el diálogo pluralista con un sistema de partidos revitalizado. In every sense, the Miami Summit broke down the walls that separated north from south in our Hemisphere and brought to an end a troubled period in our history. Thereafter it was the union of principles that guided Inter-American relations. That meeting established the commitment of all to a united, strong, and democratic Hemisphere moving toward well being, progress, and peace through free trade and economic development with equity. The Miami Summit rekindled the will to work together to overcome the many challenges facing the Americas. It was the first hemispheric meeting that included the prime ministers of Canada and the Caribbean states, as well as the first at which all the leaders of the Americas had been democratically elected.